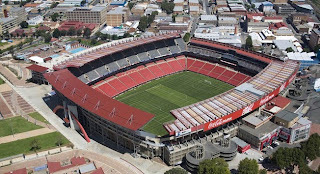 Ellis Park Stadium is located in the centre of Johannesburg and has hosted many epic sporting events including the final of the 2009 FIFA Confederations Cup between Brazil and the United States. The ground was given a significant face-lift before the Confederations Cup finals and now seats 62,000 fans, increasing its capacity by almost nine per cent from the previous 57,000. The ground will always occupy a special place in the hearts of the country’s sporting fans after the South African rugby team shocked New Zealand to lift the 1995 Rugby World Cup trophy soon after being allowed back onto the world sporting stage. It was a moment that brought the people of South Africa together in celebration as the iconic scenes of Nelson Mandela holding aloft the trophy at Ellis Park were beamed around the world. The largest piece of construction has been the new tier on the north stand which has increased the seating capacity to 62,000. With state-of-the-art media facilities, team whirlpools, top-class VIP areas for dignitaries, accessibility for disabled fans, a new pitch and a top-notch audio-visual setup to keep the fans informed during the game, no one will be left disappointed.